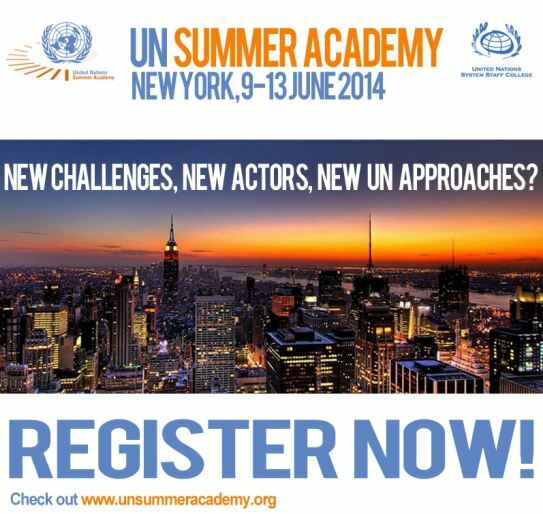 Why apply for the UN Summer Academy 2014? The UN Summer Academy is a week-long learning programme that takes place at the UN Headquarters in New York from 9-13 June 2014. It offers executive education, learning, networking and knowledge exchange to UN staff, diplomats and civil society representatives. This year’s curriculum is focused on “New challenges, new actors, new UN approaches?”, with a particular emphasis on innovation and leadership. Contributions are drawn from a highly distinguished faculty that includes Mr Jan Eliasson, Deputy Secretary-General of the UN, Under Secretary-General Hervé Ladsous, and Ms Susana Malcorra, Chef de Cabinet of the Executive Office of the UN Secretary-General. Participants will participate in a rich programme of lectures and workshops grounded on the three pillars of the United Nations, focusing on Peace and Security, Human Rights and Development, zooming on particular aspects such as innovation in Peacekeeping, the Post-2015 Development Agenda and the UN Secretary-General’s “Rights up Front” initiative. The programme aims at offering the opportunity to network, reflect and debate, while building key professional skills, such as of leadership and mediation, and share knowledge on how innovation, technology and the data revolution can contribute to the goals of the UN now and in the future. “I had a unique intercultural opportunity filled with enriching learning experiences! In this rapidly changing world, where we have new challenges and new actors, the UN shall reflect on innovative approaches to affect positive change in the world. The Summer Academy is designed and developed by the UN System Staff College (UNSSC) with the belief that by learning as one and by sharing knowledge, UN staff become better equipped to deliver as one unified and coherent system. The mission of the Staff College is to contribute to a more effective, results-oriented and agile United Nations through learning, training and knowledge dissemination.